This group was established in February 2000, as a Special Interest Group of WAGS, to recognise and research the men who formed this military unit, and their families. The Enrolled Pensioner Force consisted of soldiers, who came to the colony of Western Australia between 1850 and 1880, most arriving during the years of Transportation as Guards on the convict ships. They were soldiers who had been discharged from Military Service, and who on discharge from the army, were awarded pensions. Quarterly meetings are held at WAGS in Unit 4 / 48 May Street, Bswater in February, April, July and October. Contact the Convenor for details. Please PRINT Clearly when filling out forms. A badge is available on application for descendants of the Pensioner Guards for $10 plus $2 postage. Download the Register/Lineage form, complete and submit to the above address, with payment of $10.00 plus $2.00 postage. 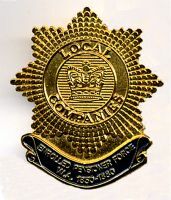 As this badge is only available to DESCENDANTS of the Pensioner Guards, your proof of Lineage will be checked by our committee.